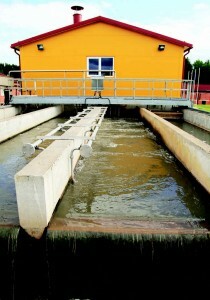 Recycled wastewater satisfies a number of demands. Many urban and agricultural areas employ nonpotable, or nondrinking, water reuse projects that meet residents’ and businesses’ demand for water. Reclaimed water use, on a volume basis, is growing at an estimated 15 percent per year, and wastewater reuse is often synonymous with wastewater reclamation and recycling. According to the Environmental Protection Agency, an estimated 1.7 billion gallons per day of wastewater is reused. Water reclamation and nonpotable reuse typically requires conventional water and waste treatment technologies that are already in practice. “Planned design reuse projects have been implemented in many parts of the country,” stated Robert Bastian, Senior Environmental Scientist with the EPA. He noted that Orange County, Calif. uses state-of-the art water purification system technology, a reverse osmosis membrane and ultrafiltration treatment process that renders a high-quality water supply. Some water-scarce regions of the country are pushing the limits of water reuse even further by processing it for potable water. The National Research Council and National Academy of Sciences note that wastewater treatment systems feature rigorous testing and multiple filters that can detect and remove contaminants smaller than bacteria and protozoa. The systems also use natural treatment — pumping treated wastewater into aquifers to filter through the drip-by-drip process that has cleaned water for millions of years. A 2012 NRC/NAS report says that in nearly all current systems designed to augment drinking water supplies through wastewater reuse, water is discharged after treatment to an aquifer, stream, or a wetland to provide a buffer between water treatment and consumption. The buffers can further remove contaminant such as pathogens from the water and provide additional retention time, sometimes over two years. However, the science necessary to design engineered natural systems to provide a uniform level of public health protection for such a process is not available at present. The developing frontier isn’t likely to be advanced by states for whom water scarcity simply isn’t a problem. The idea of drinking water that comes from wastewater is a touchy and somewhat “icky” topic anyway. No one likes to think of his or her drinking water as having originated in the bathroom. But resistance to this idea is slowly evolving. The Painted Dunes Desert Golf Course uses reclaimed water from the EPWU treatment facility for irrigation. The development and growth of new technologies for water reuse are needed urgently in the Southwest, however, to cope with increasing water demands, drought conditions, climate change and water supply reductions. One city that has been treating wastewater to drinking water standards since 1985 is El Paso, Texas. Water is scarce on the edge of the Chihuahuan Desert, where the city is located. Rainfall totals only about 8 inches a year. El Paso Water Utilities operates and manages the city’s water and wastewater systems. The plant processes about 12 million gallons of wastewater a day that goes back into the aquifer through a system of wells and ponds. The water eventually makes its way into the tap water of city residents after a period of treatment, disinfection, filtering, storage and recharge. “A small part of the water goes into the aquifer for drinking water,” remarked Christina Montoya, vice president of communications and marketing. She further noted that EPWU delivers reclaimed water through a network of pipes to parks, cemeteries, schoolyards, golf courses and to other industrial users, including an electric utility company that uses the water to cool towers. “Reclaimed water can become a safe, reliable means of augmenting municipal water supplies. We’re recommending additional national research and regulation to ensure health protection and increase public confidence in this area,” said Archuleta. 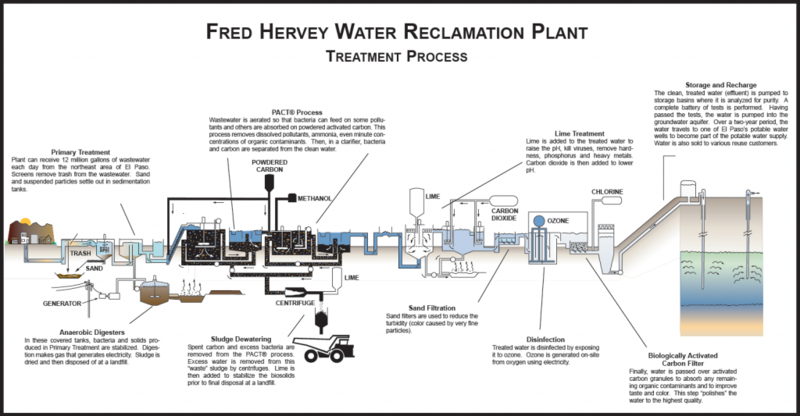 The wastewater to drinking water standards treatment process at the Fred Hervey Water Reclamation Plant in El Paso, Tex.